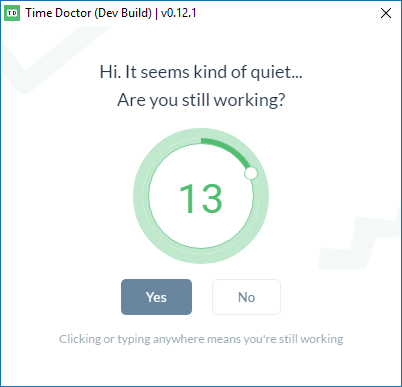 Can I change the frequency of Time Doctor reminder popups? You can change the frequency of certain reminder popups and disable others. You must be an owner or an administrator to make some of these changes. If you are not an administrator, you will need to ask your administrator to change the settings for you. Two types of reminder popups will be discussed in this article, the Are you still working? and Poor Time Use popups. This is what the Are you still working? popup looks like. It appears after a period of no keyboard or mouse activity. 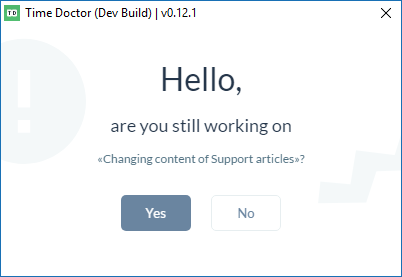 This popup appears after a certain length of time with no keyboard or mouse activity and will automatically put users on a break if they do not respond. Administrators can specify the length of time before this popup will appear. For most users, it is set to three minutes, but can be increased to as long as 1 hour. For users working from home, we recommend 3 to 15 minutes. For users working in an office with regular meetings where they will be away from their computer, we recommend 30 minutes to 1 hour. To change this setting, from the Time Doctor web dashboard, go to Settings > Manage Users. Then go to Advanced Settings where you will be able to change the popup frequency. This is what the Poor Time Use popup looks like. It appears shortly after a user opens a potential poor time use website or program. This popup gently reminds a user that they are visiting a website that may not be work-related. Administrators can enable or disable this popup for each user. From the Time Doctor web dashboard, go to Settings > Manage Users. On the Manage Users screen, go to Advanced Settings. On the Advanced Settings page, you will see the option to disable Poor Time Use Popups. Adjust as needed.